Powerful new convertible panel PC combines innovative modularity, industrial I/O and hardware ruggedization to provide reliable performance in any environment. 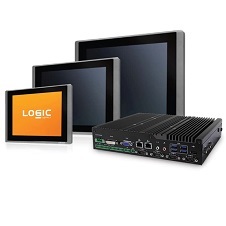 SEPTEMBER 12, 2016 (SOUTH BURLINGTON, VT) - Industrial & Embedded computing specialists Logic Supply (www.logicsupply.com) unveiled a uniquely convertible Intel Skylake Core i5 embedded panel PC to thousands of manufacturing professionals at the IMTS 2016 exhibition today in Chicago, IL. The Cincoze P2002 PC module can be attached, via the patented Cincoze Convertible Display System (CDS), to any Cincoze touchscreen display. Compatible screen sizes range from 12 inches all the way up to the company's new 21 inch widescreen model, which is also making its debut at IMTS. "The P2002 Series gives Panel PC users the power, flexibility and expandability that today's factory and machine automation applications demand, in a sleek, all-in-one system," said Ray Hsieh, Sales Director at Cincoze. "We looked at the available devices on the market and quickly realized that there were a number of key features that were simply unavailable. From Skylake Core i5 processing and PCIe expansion, to an available ignition sensing module for mobile installations, the P2002 was built to be the ideal solution for a wide range of IPC users. Through our partnership with Logic Supply we're excited to offer this versatile system to the US market for the first time." The P2002 is powered by the 6th Generation (Skylake) Intel Core i5-6300U CPU, offering more computing power, faster data processing and a 40% boost to graphics performance over previous processor generations, while consuming only 15W of power. The system features Integrated Intel HD 520 graphics for high definition image and video reproduction, as well as 32 GB of DDR4 memory, which enables twice the data bandwidth of DDR3 RAM. Dual 2.5" SATA bays (one internal, one externally accessible) provide ample data storage and built-in RAID capabilities. The Cincoze P2002 is engineered to stand up to extreme computing environments. Completely fanless, ventless, cableless and jumperless construction leaves no ingress points for contaminants and no connections to loosen or shake free, even in vibration-prone installations. The P2002 is rated against up to 5 Grms of vibration and to resist damage from a 50 Grm impact. The PC module itself is rated for reliable operation in temperatures as cold as -25°C and as hot as 70° and can accept input voltages ranging from 9~48 volts. Other features like over voltage, over current and surge protection, as well as industry-leading electrostatic discharge (ESD) shielding, all contribute to the P2002's durability. Unique Super CAP technology, which charges automatically when the system is connected to power, eliminates the worry of dying CMOS batteries to allow for maintenance-free installation. Native I/O includes VGA and DVI, offering dual display support (triple display support when configured as a panel PC), dual Gb LAN ports, 5 USB (4 USB 3.0, 1 USB 2.0), 6 RS-232/422/485 COM ports and DIO. I/O options can be expanded further by utilizing 2 full size Mini PCIe expansion slots. The P2002E (expandable) model adds an additional PCI/PCIe expansion slot for integrating more I/O or specialized expansion cards. Optional Mini PCIe I/O expansion kits will be available soon to enable additional COM, LAN, USB and Firewire connectivity, while available Cincoze Control Function Modules (CFM) can also be utilized to add power over ethernet (POE) capabilities and advanced ignition sensing for in-vehicle installations. For more information about the Cincoze P2002, and the rest of Logic Supply line of industrial panel PCs, visit www.logicsupply.com/products/panel-pc, call 802-861-2300, or visit the Cincoze booth (E3141) at IMTS 2016 from September 12-17, where members of the Logic Supply and Cincoze teams will be on hand to provide product demonstrations. About Logic Supply: A leading Industrial PC company, Logic Supply designs highly-configurable computers engineered for reliability. Its systems operate in the harshest environments and power innovation in the evolving Internet of Things. Fueled by a unique direct-to-customer business model that combines vertical integration, modular product design and a powerful online platform, Logic Supply offers computers “designed to last, built to order, and delivered in days.” Founded in 2003, the company has served over 60,000 customers. Logic Supply has offices in the US, the EU, and Taipei. See why today’s technology companies Depend on Logic at //www.logicsupply.com/.